I work with many entrepreneurs, solopreneuers and soon-to-be-entrepreneurs who all desire the same thing: more freedom. And a part of that freedom comes the desire for more money. But, the money seems to elude many. Why? 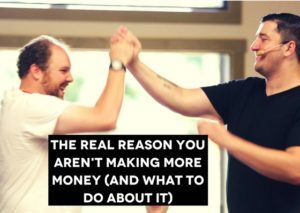 Most of the reasons people give for why they aren’t making more money are symptoms of a deeper issue. – They think they don’t have the time. – They think they need more money to get started. – They are delaying (forever) quitting their soul-sucking job. – They are not staying consistent with best practices to grow their business… like publishing consistent content online. – They are not making offers or invitations for people to work with them. – They seem to freeze when anything “tech” related shows up, even if using the “tech” is the same or easier as using Facebook, Netflix or other apps they use w/o stress. – They spend lots of money easily on things that do not matter or more the ball forward in their career, however, are penny pinchers when it comes to investing in things that will help them grow their business or make more money. – They are scared to go live on Facebook/IG, etc. – They think they have to have it all done perfectly. – They need a plan that they are 100% sure will work. What’s the root of all this? If these are just symptoms, what’s the real cause? You see, trauma changes your brain. It creates a “new normal” in your body where you are constantly aware of, looking for, being vigilant to prevent… more trauma. And, unhealed emotional trauma comes in many forms. Sometimes it can be big and sometimes is can be small. And, many times, it’s not about what happened… but how you held it afterwards. It’s commonly reported that it can be more traumatic to suffer alone or silently for a long time, than the actual events of trauma. So, after we experience trauma (and we all do to one degree or another) – the brain changes. The nervous system adapts and takes on the stance of defense and vigilance. The body is always looking to maintain homeostasis (aka balance). It’s like a thermostat… never too hot and never too cold. Just right. For purposes of this blog, it’s… never too rich… never too poor… it’s just right. The reason why you aren’t making more money is because your nervous system doesn’t want you to do anything new. Anything that could disturb the balance it’s working to maintain for your survival. Many of the habits I listed above… the symptoms if you will – all represent taking your body and nervous system out of homeostasis (out of balance) and pose a generalized threat to your survival. So, even though most of the “tech” is easy to figure out, your nervous system will make you all confused, scared and want to give up. So, you’ve got to intervene and send your body signals you are safe. That is where meditation, trauma work, a peer group to support you… and a mentor come into play. You can’t intervene on your nervous system alone. Making more money isn’t about some whiz/bang/boom strategy du jour. It’s about feeling safe in your self, feeling safe in your choices and knowing that no matter what… you got this and you won’t die. Going live on Facebook won’t’ kill you. Figuring out the “tech” won’t kill you. Making an offer won’t kill you. Heck, even getting rejected won’t kill you. But… staying the same… not changing… that is slowly killing your purpose and your soul. If you need help and coaching to do your trauma work, to breakthrough these inner blocks… that’s exactly why I wrote my book, Claim Your Power. It’s a 40-Day journey to discover the hidden blocks (traumas) that are holding you back… and how to overcome them and make friends with them. Claim Your Power can help you turn your nervous system into your ally… and support you every step of the way. I even created a free coaching course to go along with it, so you don’t have to do it alone. >Grab your copy of Claim Your Power here. Let’s turn your nervous system into your ally, let’s create a new normal and let’s uproot all the things that are holding you back from earning more financially. Remember to get out there, take action and make your Purpose real.